My usual apology for ignoring my blog... I actually have been thinking about redesigning the site so that I can pull in content from flickr, twitter, tumblr, etc., to better reflect my larger web presence. But that is a topic for another time. 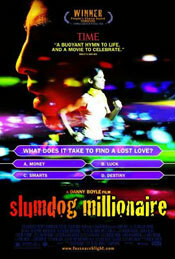 I saw Slumdog Millionaire last night and am pleased to report that it lives up to the hype. It is a very well-constructed story, using each question from the game show to tell a different part of the hero's life. The movie leaves the viewer with a grim view of life in the slums of India, and it includes some scenes which caused my (rather squeamish) wife to cover her eyes. However, the movie never becomes depressing because of an underlying current of hope that runs throughout. This has the danger of leaving audiences overly optimistic about the plight of the poor. After all, part of what makes the story so compelling is that it is so improbable. Yet, I think the movie successfully straddles the line between raising awareness and not turning people away. I really got a kick out of the credits for the movie, which feature a "standard Bollywood"-style dance. In an otherwise non-standard Indian movie, this is a very cute joke to throw in at the end. I have seen several movies in the last couple weeks: Wall-E, Wanted, and Batman: the Dark Knight. Two of these were spectacular. Another was spectacularly terrible. I have already encouraged you all to see Wall-E, so let me say a few things about the other two. This movie is a perfect example of a movie made for Mystery Science Theater 3000. The main character is so utterly unlikeable as to make the audience completely apathetic to his fate. The story is ridiculous, and I am not talking about the usual level of comic book ridiculousness either. When you (spoiler warning) find out that the assassins are getting their targets from a loom, and that the other characters find this completely normal, you know something has gone wrong with your screenplay. The movie could get away with this if it were about explaining the origin story of the hero; however, the plot and morality of the actions of the main characters depend crucially on this plot device. The upshot of this, though, is that it makes the movie mostly laughable. I was left thinking, "what?!" so many times that I was laughing. So, in the end I was entertained by the impressive special effects and the (unintentional) hilarity of the story. I left the theater in a good mood. Wow. I mean, wow. Spooky, creapy, dark... but with enough sunshine seeping through the cracks as to not become so depressing that it loses its audience. Summed up well by the movie itself, sometimes "the night is darkest before the dawn". A probable posthumous Oscar is in the works for Heath Ledger. Let me join the everyone else in proclaiming that Wall-E is a great movie, among the best Pixar has produced. Pixar must have an amazing shop to continue to deliver such high quality. You also shouldn't miss this intriguing op-ed comparing the themes of Wall-E to the presidential race. 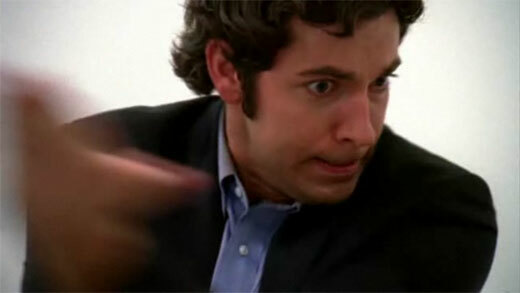 I am excited for the return of Battlestar Galactica next Friday, despite a rather ho-hum season 3. I am told that the writers recognize that their project to do more standalone episodes did not work with the show's story and characters. Consequently, I am hoping that we see a return to the broad story-arcs of seasons 1 and 2.